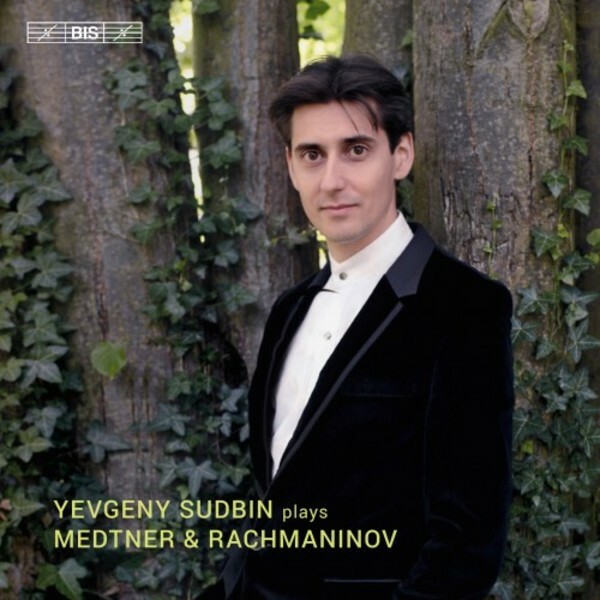 Having previously released recordings of Medtner’s three piano concertos as well as three of Rachmaninov’s five concertante works, Yevgeny Sudbin on the present disc combines solo pieces by the two friends and fellow-composers. From Sergei Rachmaninov’s rich and varied production he has chosen six of the celebrated preludes, including ‘Alla marcia’ in G minor (op.23 no.5) as well as the much-loved Prelude no.12 in G sharp minor from the op.32 set. But Sudbin, who is a great admirer of Nikolai Medtner, opens his new disc with a generous selection of that composer’s solo piano music. This section begins with the Prologue from Stimmungsbilder, the eighteen-year-old composer’s Opus 1, and closes with the Sonata tragica, composed shortly before Medtner left Russia in 1921, never to return. It also includes three of the thirty-some Fairy Tales that Medtner composed throughout his life. ‘No one tells such tales as Kolya’, Rachmaninov used to joke affectionately, and with these pieces Medtner created his own, unique genre. He himself used the Russian word skazka or German Märchen to describe them, and in his liner notes Yevgeny Sudbin suggests that the creative impulse came not only from folklore but also from such diverse sources as Pushkin, Shakespeare and even the Bible. As an interpreter of both these composers, Sudbin has proven himself both in concert and on disc, with previous recordings being named ‘Disc of the Month’ in Gramophone, ‘Essential Recording’ in BBC Music Magazine and ‘10/10’ on ClassicsToday.com, to mention just a few of the distinctions awarded them. This is the latest in a series of discs from pianist Yevgeny Sudbin on the BIS label championing the music of Nikolai Medtner. And Medtner could hardly ask for a more passionate, understanding or talented advocate than Sudbin. This selection of the composer’s solo piano works, including two one-movement sonatas, can easily withstand being placed alongside a group of Preludes by Medtner’s close friend Rachmaninov, especially when the playing is so stunning. Sudbin’s limpid touch reveals unexpected depths even in the slightest of the Medtner pieces, such as the three selected Fairy Tales, or the rapt Prologue from the early Stimmungsbilder, op.1 (1895). Indeed, it’s a constant source of wonder that Sudbin is able to delineate the different layers of texture with such a combination of clarity and poetry. In the longer works – the relatively well-known Sonata-Reminiscenza and the dramatic Sonata tragica – there’s a level of musical commitment and a variety of tone and dynamics that completely transport the unsuspecting listener. The Sonata tragica follows straight on (as the composer wished) from the delightful Canzona matinata, which in this performance has a brilliant rhythmic flexibility to it, together with a velvety-soft touch. Sudbin’s playing combines, to a rare degree, technical mastery (rhythmic precision, the ability to ‘voice’ a chord to perfection) with real expressive engagement and understanding. It’s easy to imagine Medtner’s rhythmically and polyphonically complex music being used by some pianists as mere showpieces. With Sudbin, by contrast, there’s musical honesty and complete lack of pretension, allied to an ability to transcend the technical demands of the music. His enthusiasm for this music is never in doubt, conveyed not just by his matchless playing but by his compelling booklet notes. The same strengths are evident in his Rachmaninov: this is a nicely-balanced selection of six Preludes from both the op.23 and op.32 sets. The barcarolle-like D major Prelude, op.23 no.4, is clearly deeply felt, and it’s followed by a memorably exhilarating account of the famous G minor Prelude, op.23 no.5, which has real rhythmic bite and poise. Just as impressive are the four op.32 works: Sudbin brings a ferocious intensity to the F minor Prelude (no.6), but just as remarkable is the Ravel-like sensitivity and luminosity in the ‘watery’ numbers 5 and 12 (G major and G sharp minor). The recordings – drawn from several dates in 2009, 2012 and 2014 – are well-matched, ideally placed (giving a front-stalls perspective) and bring out the tonal riches of the Steinway model D. These performances are not only technically exemplary, but emotionally thoroughly gripping. A really compelling release!